Advice for hitters: Don’t use your head! Just because your eyes are moving doesn’t mean your head has to be moving too. Already knew that? Of course you did. But it’s an important point for coaches to emphasize to young volleyball players who are seeking ways to improve their hitting. Here’s why: When the setter delivers the ball, less experienced players often make the mistake of tilting their entire head back as they watch it. The unintended consequence is that the ball usually ends up above their head or even in back of their head. As you know, the ball should be in front of the hitter. 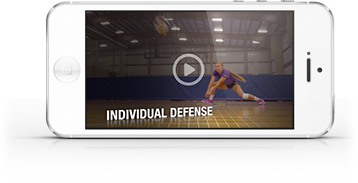 Check out this video to hear it explained by Cary Wendell Wallin, a former NCAA Player of the Year at Stanford who later played for the U.S. national team. This may sound like a tiny thing in the context of the overall game, but it was considered important as far back as the 1960s when players on the Soviet men’s national team were given harnesses to put on their heads so they could only track the ball by moving their eyes. Playing volleyball while wearing what amounts to a straightjacket for your head may seem a bit Draconian by today’s standards, but it’s the kind of measures the Soviets took to be successful, and they were. They dominated the world in the 1960s and early ‘70s, both in the men’s and women’s game. The Soviet men won gold at the 1964 and ’68 Olympics, and the women won silver in ’64 and gold in ’68 and ’72. When it came to volleyball training or athletic training in general, no country in that era was more innovative than the Soviet Union, says Terry Liskevych, who coached the U.S. women’s national team at 3 Olympics from 1988 to 1996. The game has obviously evolved a great deal since those days, but certain fundamental principles remain. Keeping a level head when hitting is one of them. Don Patterson is the editor of VolleyballUSA and DiG magazines and the senior content director for Art of Coaching. Previously, he was a sportswriter for the Los Angeles Times and an editor at CBS Sports.